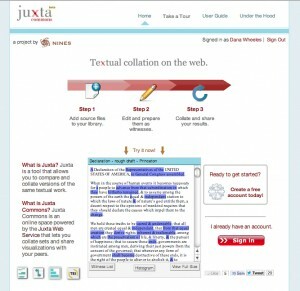 Juxta Commons is the newly-released destination site for using Juxta on the web. Powered by the Juxta Web Service, Juxta Commons offers users the option of uploading files, linking to them on the web, or creating them in its very own text editor. The visualizations that were made popular by the desktop client have been translated for use in a browser, and optimized for sharing. Visit Juxta Commons and create your free account today!